With my Dad’s recent trip to India, he has become more interested in its history and especially about this particular individual. 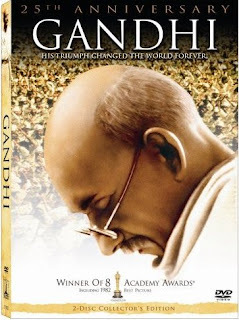 This film on Gandhi’s life had been re commended to him by a couple people, so he picked it up. And after watching it, I would like to pass on the recommendation* (see below) to you. This was a character that I really knew nothing about prior to watching the movie, which is rather a shame. I found the movie, which is three hours long, not only a Magnificent production, but also quite educational. 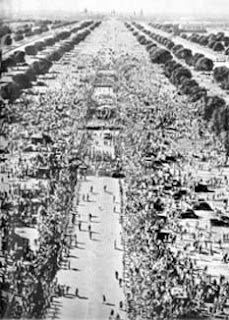 A couple things that may strike you from watching it is the incredible performance of Ben Kingsley (who played Gandhi), and the enormous crowds. Another aspect that may not be quite so evident is the extraordinary script written by John Briley. Mohandas K. Gandhi was born in 1869 and was assassinated by radical Hindus on January 30, 1948 at age 78. The fact that approximately 300,000 extras showed up for the film’s reenactment of his funeral procession 33 years later shows the extraordinary position this man held in his country. Also, an interesting note on the production of this funeral sequence, is, being as it would be very difficult to shoot these massive scenes twice, they would have to capture the whole procession the first time. There were 11 crews who shot 20,000 feet of film, which was then edited down to only 125 seconds for the final release. That’s impressive. 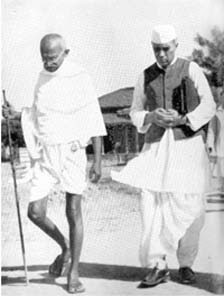 I believe one of Gandhi’s main messages was nonviolence in order to achieve political and social progress. He was very strong on the fact that the British rule of India was evil, that he wanted no part of it, and that it must stop. But not by violence! By non-cooperation with injustice. His own words in the movie— “An eye for an eye only ends up making the whole world blind.” And, “Whenever I despair, I remember that the way of truth and love has always won. There may be tyrants and murderers, and for a time, they may seem invincible, but in the end, they always fail. Think of it: always.” With many circumstances leading up to it India eventually became a free nation. He also spoke out for unity; “I am a Muslim and a Hindu and a Christian and a Jew and so are all of you.” Here is Gandhi’s view of religion and here is Gandhi’s religion. Also if your interested…his philosophy. 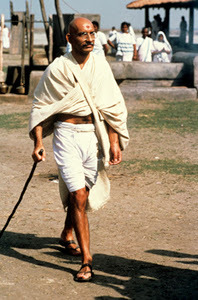 As far as I can tell from the movie and his own writings, Gandhi unfortunately never became a born-again Christian. From what I gather, he believed that doing good and being good alone would secure your salvation in the age to come. It would seem sad to me that a man like this would stand up for such laws and Christ-like principles and yet deny the law-giver as the one and only savior for man. Without the redeeming work of the Lord in our hearts and His forgiveness, we can never be good enough for God. Gandhi knew he was sinful and that sin was wrong, but it was a life-long struggle for him to try and find it within himself to overcome it. A Christian in Gandhi’s shoes could have been such a testimony! Or maybe a Christian would not have fit in Gandhi’s shoes. God knows. One of my favorite parts in the movie is near the end where Gandhi is fasting because he was not pleased with how the Hindus and Muslims where treating each other (there were killings, riots, and hatred). Although Gandhi had achieved many of his aims, the India he imagined was still not quite present. A couple days into his fast, his body was rapidly shutting down (he was already quite old), but he was still wanting to see proof that the violence was over before he would eat. 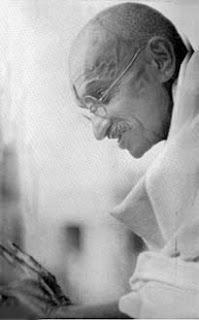 There were measures taken for peace when word got out that Gandhi was fasting until death unless the rioting was resolved, but Gandhi, being a stubborn man, wouldn’t settle for just signs that it was stopping or actions taken here and there hinting at peace, he wanted it to be definite. Everywhere. I’m not sure how accurate that plan of salvation is, but they’re riveting words nonetheless. They’re words that pretty much wrap up the message of his later life, and they are a good picture of what he lived and died for. "If I am to die by the bullet of a mad man, I must do so smiling. There must be no anger within me. 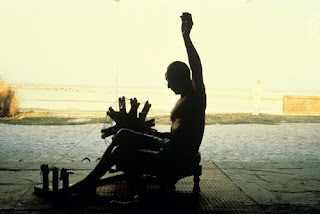 God must be in my heart and on my lips.."
—Mohandas K. Gandhi, on January 28, 1948, two days prior to his assassination. 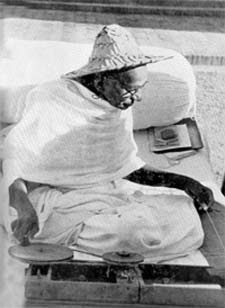 For more information on Gandhi, check out this site. *Please use caution showing this film to children because there is a fair amount of violence in the film, hence the PG rating. A number of sequences were not suitable for most in my family to view.